The Story Collider returns to Vancouver on May 22 for another evening of true, personal stories about science! Our five guests will share stories on the theme "sense of self." Hosted by Kayla Glynn and Armin Mortazavi. Doors open at 7 pm. Nicole Balsdon is the Education & Outreach Coordinator at the Beaty Biodiversity Museum at the University of British Columbia. Before her path took her to museums, she studied Environmental Biology at the University of Alberta. 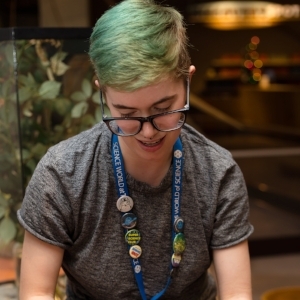 Her passion is creating opportunities for science education and fostering connections between scientists, research, students, and the general public. Charlie Cook is a non-binary stand up comedian by night and a non-binary science educator by day. Their favourite topics include queer theory, entomology, and outer space. To hear them tell more stories, check out One of a Kind at Carousel Theatre from May 28th to June 3rd! Jaymie Matthews calls himself an astrophysical “gossip columnist” who unveils the hidden lifestyles of stars by eavesdropping on “the music of the spheres.” His version of an interstellar iPod is Canada’s first space telescope, MOST (Microvariability & Oscillations of STars), which detects vibrations in the light of ringing stars too subtle to be seen by the largest telescopes on Earth. MOST also makes Professor Matthews an “astro- paparazzo” by helping him spy on planets around other stars that might be homes for alien celebrities. Celebrities? Maybe not beings like the fictional Vulcans, but even the discovery of extraterrestrial microbes on another world would qualify those microbes as newsmakers of the century.Dr. Matthews is a Professor of Astrophysics in the Department of Physics & Astronomy at the University of British Columbia (Vancouver, Canada). He leads the MOST mission as part of a broad research programme. Prof. Matthews is an expert in the fields of stellar seismology (literally using the surface vibrations of vibrating stars to probe their hidden interiors and histories), exoplanetary science, and astronomical instrumentation and time series analysis. Chantal Mustoe is nearing the end of her PhD in chemistry at UBC. Her research focuses on the interpretation of squiggly lines and what they can tell us about atoms. She helps design murder mysteries for high school students to solve and puts on chemistry magic shows in her spare time. Derek Tan is the Digital Media Specialist at the Beaty Biodiversity Museum. Born in Vancouver, he grew up in Burnaby next to the lakes and woods and the Trans-Canada Highway. He majored in biology and art history at the University of British Columbia and has worked as a photographer, illustrator, and multimedia designer, with the goal of communicating the primacy, mystery, and wonder of the natural world.